The sun is the hottest when the clock strikes one in the small town of Seringapatam, not far from the city of Mysore, in present day Karnataka, a state in India. Colonel Arthur Wellesley, who was leading two army units of the British East India Company, knew that the defenders of the fortress of Seringapatam would be taking a break for refreshment at this hour. That’s when he planned to strike. bullet riddled body of Tipu Sultan, “the Tiger of Mysore” was found. The victorious troops then proceeded to raid the royal treasury and over the next few weeks systematically emptied it, sharing the loot among the British army. Some time later, a curious object was discovered in the music room of the palace. 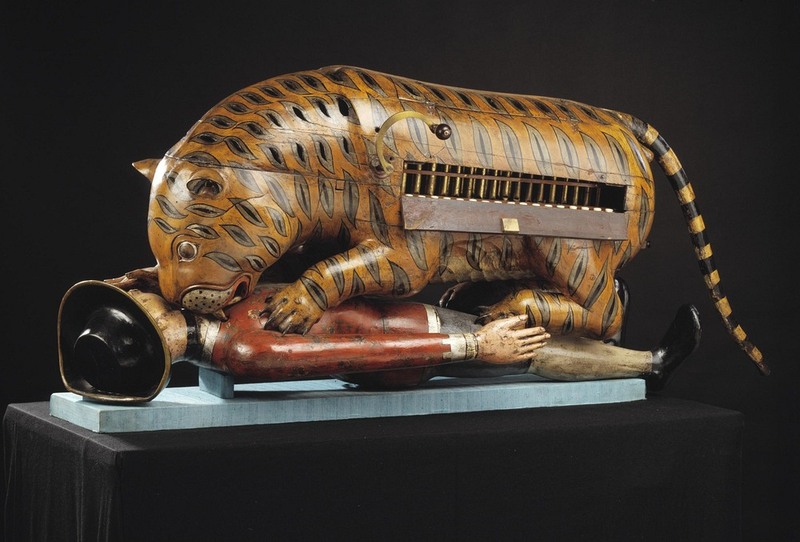 It was a large wooden musical automata depicting a tiger mauling a man in European clothing. The man, which is nearly life-size, lies on his back while the tiger sinks its teeth into his neck. There is a crank protruding from the side of the tiger. When it’s turned, a hidden mechanism causes the man’s arm to go up and down, while a set of bellows inside causes the animal to growl and the man to emit distressing cries of agony. A flap on the tiger’s body can be opened to reveal a small organ and a keyboard capable of playing 18 notes. Tipu Sultan’s mechanical tiger—known as Tipu’s Tiger— was a clear representation of his hostility towards the British—a feeling that he shared with his father, Hyder Ali, since his childhood. Hyder Ali regarded the British as their sworn enemy as they prevented Hyder from expanding his kingdom, and Tipu grew up with violently anti-British feelings. In 1792, when Tipu Sultan was forced to concede half of Mysore’s territories along with a large financial tribute to the British after the defeat at the Third Anglo-Mysore War, he had this machine built. Tipu Sultan’s personal emblem was the tiger. The tiger motif was visible throughout his palace—on his throne, on his weapons and armor; the tiger stripe motif was painted on walls and used in uniforms; he even kept live tigers in his palace. Even his nickname that he adopted for himself was “the Tiger of Mysore”. Tipu’s Tiger, hence, was a symbolic representation of his desire to triumph over the British. It’s believed that the Sultan had frequently amused himself by playing with the instrument’s crank and hearing the distressing cries of the victim. Understandably, the British were not amused. When they discovered the “contrived machine”, the Governor General of the East India Company wrote a memorandum calling it a “memorial of the arrogance and barbarous cruelty of Tipu Sultan” and “another proof of the deep hate, and extreme loathing” the Sultan had towards the English. For a while, Tipu’s Tiger was displayed in the reading-room of the East India Company Museum and Library in London where it became very popular, especially since anybody could walk up to the machine and hand-crank it to hear the wailing and the grunting. The handle couldn’t take the abuse for long and it broke a few years later, to the great relief of the students using the reading-room in which the tiger was displayed. In 1880, the tiger was acquired by the Victoria and Albert Museum in London. Since then, it has been one of the most popular exhibits in the museum and a “must-see”, although it’s too fragile now and cannot be operated. During the Second World War, the roof above the museum came crashing down and broke the tiger into several hundred pieces. After the war, the tiger was carefully pieced together, but it no longer works. In recent times, Tipu’s Tiger has formed an essential part of museum exhibitions exploring the subject of Indian resistance to British rule, as well as British prejudice and imperial aggression. Tipu’s Tiger appears in various forms of memorabilia in the museum shops as postcards, model kits and stuffed toys.